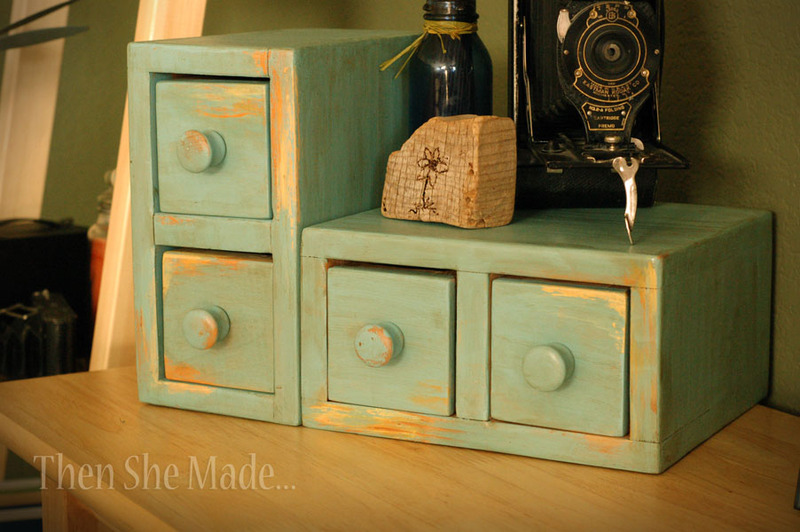 Then she made...: wax + paint = awesomeness! 2- Paint your first color. I painted yellow but I didn't paint the whole box, just in the spots I wanted the yellow to show. 3- Paint your second color. For me that color was orange and again I only painted it where I wanted it to show, I did not paint the whole box. 4- Once your paint has dried take a candle, preferably a white or off white one - no color - and rub it over the area you painted. So, for me, I just rubbed it lightly on over the area with the yellow and orange paint. 5- Then using your main color, for me that was blue, paint the rest of your project. Because of the wax, the paint will not coat over the other colors. Cool, right?! 6- After the blue paint had dried, I scrapped and sanded some of the wax off and then I applied one coat of Polystain, it's stain mixed with polyacrylic, and I was done! So easy! 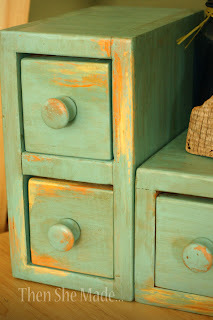 I love how the yellow and orange look like old paint layers and how the stain gives it a distressed, antiqued look. It may have taken me 10 years to get this project done but I tell you what, it was so worth the wait! That is amazing! I am going to have to try this! Thanks again for a wonderful, well laid out tutorial! I'm going to try the wax thing, I had never heard that before. I'm your newest follower today! 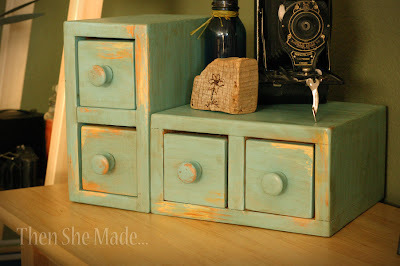 I'm so glad I found your blog through Blue Cricket Design's link party.